There are so many beautiful islands to visit all around the Caribbean, and it can be so difficult to find the right one for you. Choosing a Caribbean vacation destination is almost impossible, but there aren't really any bad choices as the islands are all stunning to look at and have their own unique charms and features for visitors to enjoy. However, if you're looking for a great all-round Caribbean destination that can appeal to couples, families, groups of friends, or solo travelers, St Martin needs to be at the top of your list. This island is found among the Lesser Antilles and is divided into two sections. The northern part of St Martin is a French territory, while the southern section is part of the Kingdom of the Netherlands. Both sides of the island are known for offering a warm welcome to all travelers, with the Dutch half being better-suited for party-goers and nightlife enthusiasts, while the French side provides unique cuisine and interesting shopping opportunities. Despite the fact that the island is split between France and the Netherlands, English is actually the most commonly spoken language here, so it's a convenient place for travelers to stop off, and both sides of the island boast some truly world class beaches. St Martin is lucky enough to have stunning beaches in every single direction. There are over three dozen named beaches on the island, found on the east, west, north, and south coasts. Each coast has its own advantages and features, with the height of the waves and strength of the current varying at each location. Whether you’re looking to surf, swim, snorkel, or sunbathe, you’ll find a great St Martin beach to meet your needs. Read on to learn all about the best beaches on this Caribbean island. Nicknamed 'Saint Tropez of the Caribbean' Orient Bay is regarded as arguably the most beautiful and best-equipped beach on the whole of St Martin. It's situated in the French side of the island on the northeastern shore and has a lot of great restaurants, hotels, shops, and rental places to fill your day with fun activities and awesome food. Lots of celebrities and stars have been spotted at this St Martin beach over the years and it consistently ranks as one of the top beaches in the whole Caribbean. Even people who have never visited St Martin have probably seen photos of Maho Beach. It's one of the most iconic beaches in the world, especially for photographers, as it is very closely situated to the local international airport. 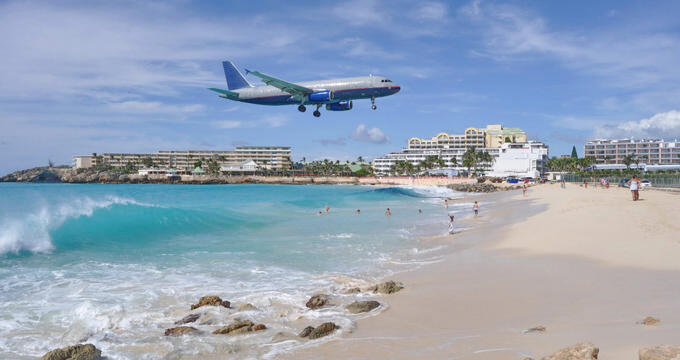 In fact, the airport's runway leads straight towards the beach, so as planes are landing and taking off from St Martin, they fly right over Maho Beach, blasting the sands below with extremely strong gusts of wind as they pass by. This means that Maho Beach isn't exactly the most peaceful place in the world, but it's definitely one of the most unique St Martin beaches of them all and is located in the Dutch part of the island on the southwestern shore. Long Bay is the most easterly beach on the French part of St Martin. As the name suggests, it's also one of the longest beaches on the island, offering a large, wide stretch of sand for all to enjoy. It's a popular beach but never gets too crowded, even on the busiest of days, due to its enormous size. As a west-facing beach, this is a super spot to watch the sunset, and the way the bay is formed causes the waves here to be very small and gentle, making Long Bay a great swimming spot at St Martin. Located right by the village of the same name, Grand Case Bay is one of the top rated and most popular beaches on the northern side of St Martin. The geological formation of the island means that the waves in this bay are really calm and shallow, just right for some casual wading or a gentle stroll along the water's edge. The local village has a lot to offer too, with plenty of tasty seafood treats and fine dining options just a short walk off the sand. This is also a good diving beach, so it can appeal to every kind of visitor. If you're visiting St Martin with your partner or perhaps even choosing this Caribbean island as a honeymoon destination, Lovers' Beach is the place for you. It's an exceptionally small beach, with barely enough sand for a single couple, hence the name, but is well-worth the trip as a special surprise for the one you love. It's the smallest beach on the island but provides some very pretty views of the nearby rocks and the Caribbean Sea. If you're willing to head off the shores of St Martin to another little island, Pinel Island is a super spot to visit. It's situated just a short distance away from St Martin's eastern coast and is covered with lush vegetation, home to a lot of wildlife. It feels like a lost piece of paradise out in the middle of nowhere and is the closest many of us will ever get to seeing how it feels to live on a private island. There are two beautiful beaches on this island. One of them faces towards St Martin, offering some super photo opportunities, while the second is more rocky than sandy but still worth a look. To reach Pinel Island, you can hop on board one of the Saintoise boats at Cul-de-Sac. The crossing only takes ten minutes.